Have you ever stood in your empty classroom at the beginning of the year and just not known where to start? Have you gotten part way through the year and realized the space or the supports in the space just weren’t working? I have many teachers email me with questions about how to best set up their classroom or for organization strategies and I wish I could help everyone. As part of my work consulting and training in schools in the past 20 years, I have set up multiple classrooms every year in all different kinds of environments for all different kinds and ages of students. 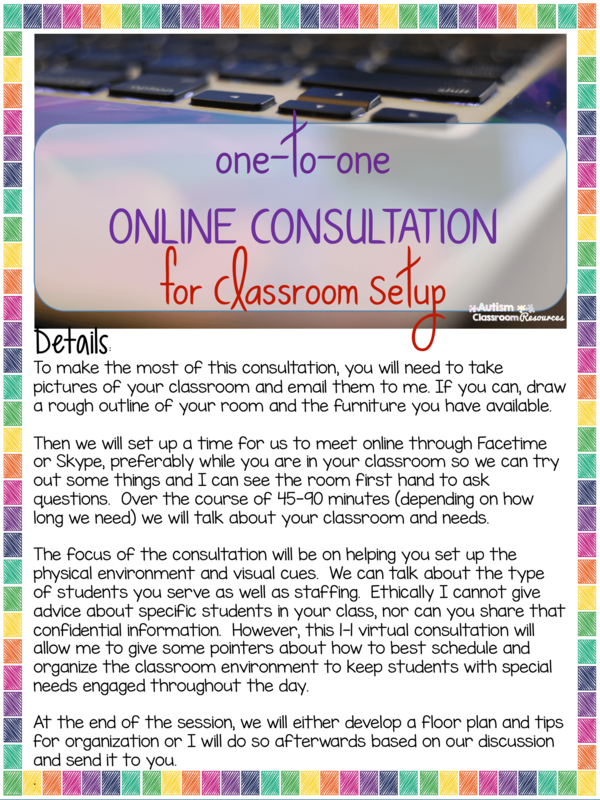 The 1-1 Online Consultation for Classroom Setup is an opportunity for you and I to meet 1-1 online to talk specifically about your classroom and how you can arrange it to best meet your students’ needs. And keep reading because you can have a chance to win it. 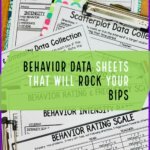 If you are new here, I am a board certified behavior analyst-doctoral who has spent the last 20 years working in special education at various ages and levels from behavior specialist and support to administrator, author and researcher. I’ve consulted and trained across the country helping teachers establish effective and efficient classroom environments. 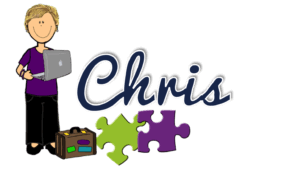 I’ve written chapters and books about classroom organization as well as presented at numerous conferences and workshops across the United States on the topic. One of my favorite activities is working hands-on with teachers in their classrooms. *Disclosure: This post contains affiliate links, which means the book will cost you the same but a little bit of that comes back to me. Also, thanks to Lovin’ Lit for the background paper on the picture below. Let me help you. The 1-1 Online Consultation for Classroom Setup will be available soon in my store and/or on this site. But you have the chance to win one now! This is a $79 value that I am giving away to one lucky winner. 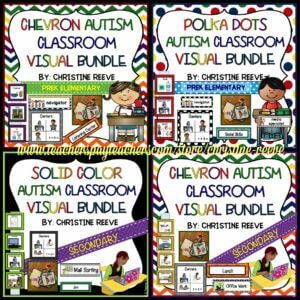 In addition, that winner will receive his/her choice of my Autism Classroom Visual Bundles in solid, chevron or polka dot. 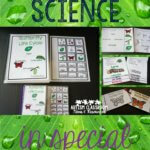 These bundles sell for $11 and include color-coded individual picture schedules and written schedule cards, classroom rules, classroom jobs, check-in and group schedule visuals. 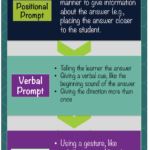 In addition, I will share a new product that is not yet published to provide reminders and cues to the adults in the classroom for prompting, reinforcement and instruction. Freebie Ebook and More Giveaways! And the fun doesn’t stop there! I know going back to school can be hard to think about so we wanted to make it just a little bit better. 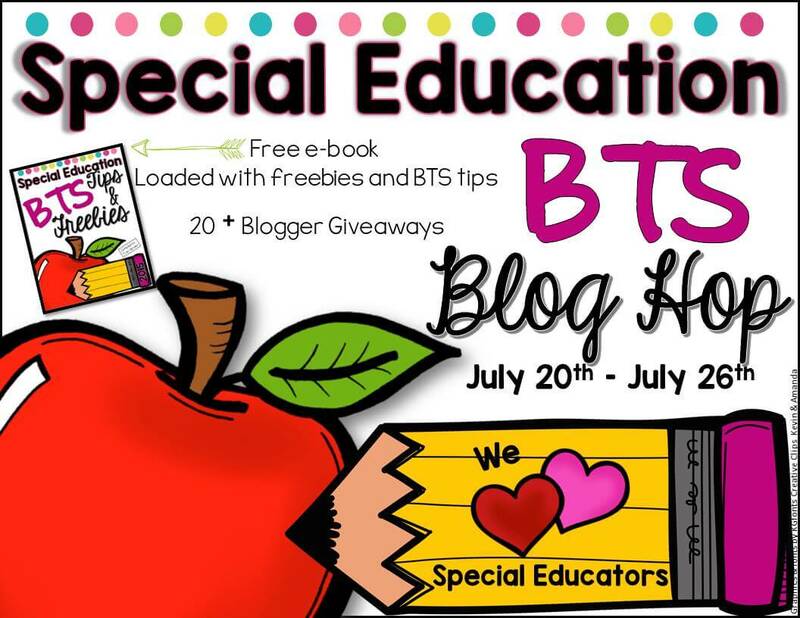 A group of super special education bloggers from #WeTeachSPED have created a special e-book of freebies to help you get ready for back to school. 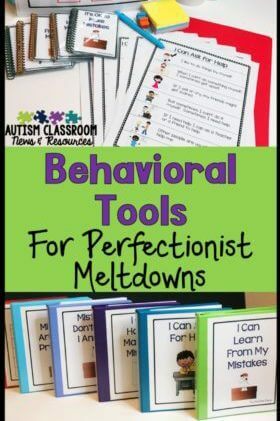 Each page in the free download (click the picture above) has a tip from one of us as well as a link to at least 1 free item ready for you to download and use in your classroom. 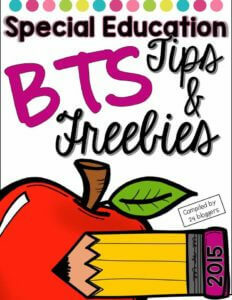 There are 24 bloggers who joined up for this so there are 24 tips and more than 25 freebies for you to use. So, are you ready to enter the giveaway. Enter through the Rafflecopter below and it will draw a winner on July 26, 2015 at 11:59 PM eastern. Then, check out all the other bloggers’ giveaways in the linkup below.